Raise the Bar's first spoken word show of 2019, featuring an all-star lineup of headliners - Travis Alabanza, Caroline Teague and Rob Auton! Raise the Bar's first show of 2019 will feature an all-star lineup of headliners - TRAVIS ALABANZA, CAROLINE TEAGUE and ROB AUTON! Raise the Bar has for the last 4 years been bringing the country and world’s finest spoken word performers to Bristol, as well as providing a talent development platform for emerging artists in the South-West. Our resident DJ Ngaio (of Booty Bass) will be spinning an incredible selection of hip-hop, R&B, world music and UK underground. Travis Alabanza is a performer, writer and theatre maker blending poetry, style and risk-taking. 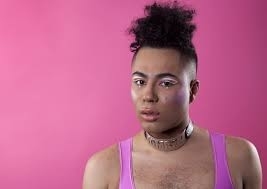 In the last two years they have been noted by numerous publications, such as ARTSY, ID AND MOBO _AWARDS, as one of the most prominent emerging queer artistic voices, and also listed in OUT as an influential queer figure, appeared in campaigns with MAC X ASOS and performed across the country and internationally. Known for increasingly paving much of the UK conversation around trans politics, Alabanza has became a staple part of the London queer scene and further afield. Giving talks and performances at over 40 UK univerisities, ranging from the RCA, Central St martins, Oxford university and Cambridge, & abroad such as Harvard, Brown university & Austin Texas. Their debut poetry book ‘Before I step Outside (you love me)’ released in 2017 has been shipped to over 19 countries world wide and listed as one of the top trans literary books of 2017. Their new show BURGERZ, fresh from a sell-out run, looks at how trans and gender non-conforming people move through the world and interact with others, questioning the responsibility that people have to each other. Rob is a York-born, London-based poet and comedian who has had two collections of writing and illustrations published by Burning Eye Books and has had his poetry featured as short films on Channel 4. Rob was shortlisted for the 2015 Arts Foundation Spoken Word Prize in association with the Southbank Centre, and has recently made appearances performing live on the BBC, Russell Howard Hour, Comedy Central and more. Rob Auton is well known in the public domain for his critically acclaimed Edinburgh Fringe shows, which tour all around the country regularly, and in 2013 even landed himself the ‘Dave Funniest Joke of the Fringe’ Award. One of the Edinburgh Fringe’s most consistently successful acts, his one man poetry shows The Yellow Show (2012), The Sky Show (2013), The Face Show (2014), The Water Show (2015), The Sleep Show (2016), The Hair Show (2017) and The Talk Show (2018) have all been 5 star reviewed sell-out performances. Caroline Teague is a London born and bred poet writing pieces on loss, identity and how she comes to terms with some harrowing realities of being human and being alive, in a style she calls 'tragic optimism' hoping that the honesty through her writing can translate into something positive and comforting for someone else. Creator of the musical project "Caroline Smiling" which blends music, spoken word and other forms of communication to cross platforms for mental health and queer identity through creative means. A self proclaimed soft touch poet with some sharp edges.